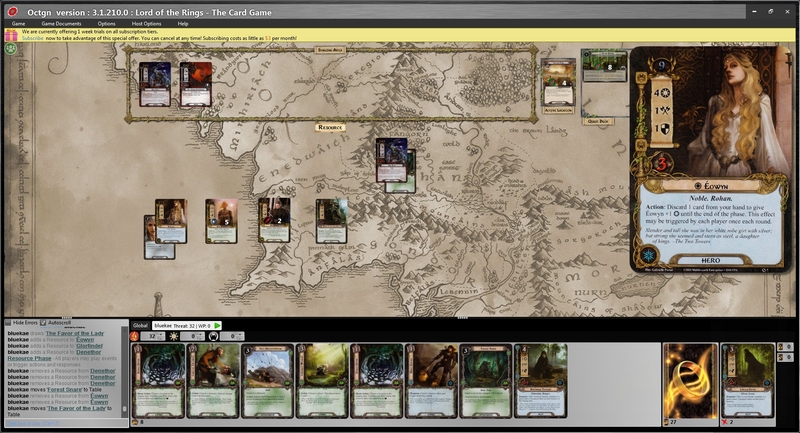 Last night I played Lord of the Rings: The Card Game by Fantasy Flight online with Wininoid using OCTGN. 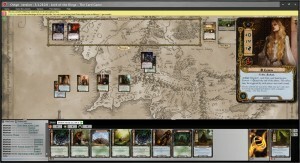 OCTGN is a platform for playing card games online, and LotR support is provided by another developer here. We attempted to complete the second quest in the game which is Journey Along the Anduin. Winin used a full Tactics (red) deck which is very damage oriented, while I used a Spirit/Lore deck which was focused on questing and healing. In the quest, you start out facing a Hill Troll and have to defeat it to move onto the second of three stages. We got good cards and managed to complete quest progress on the first stage and defeat the Hill Troll pretty quickly. The second stage started out well but some bad cards both on our part and from the encounter deck, cost us one of Winin’s heroes (each player has three) and really hamstrung what we could do. Eventually we lost the game. I’d like to say it was a close thing, and we might have been able to clear the second stage had we had another round or so, but there’s no way we’d have been able to complete the whole quest. This was the first time either of us had used OCTGN, so it was a little rough getting started. The UI for the application relies heavily on pop-up menus and shortcuts, which took a while to get used to, but by the end of the game we had a pretty good handle on it. But UI issues aside, the program worked well. I’m sure we’ll be using it for more games of LotR as well, definitely a rematch against Anduin after we tweak our decks, as other games like Android: Netrunner. 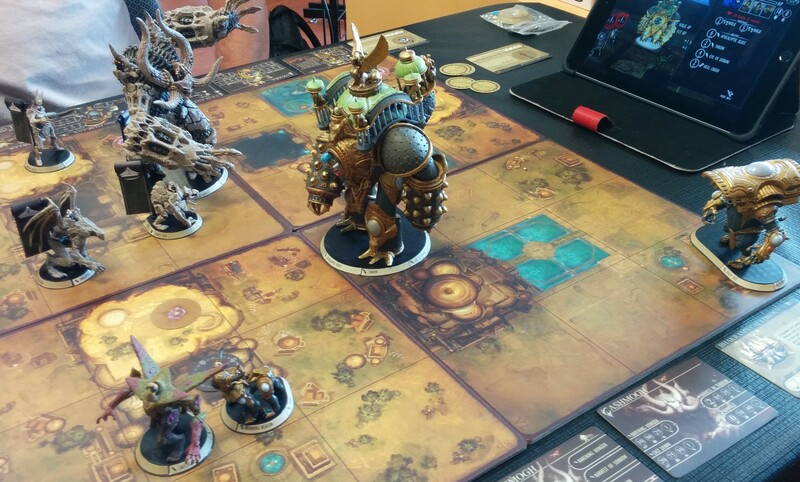 About two or three Saturdays a month since March, I’ve been heading down to my local gaming store and playing Golem Arcana. Usually I feel a little guilty because I’m gone for about five hours and leaving my wife to deal with Thing 1 and Thing 2 solo. This weekend though, my dad was taking Ting 1 for the day, and Thing 2 is much easier to handle without his older brother winding him up. So I was able to have a nice guilt-free wargaming visit yesterday. I got three games in, didn’t win any off them but they were still fun. Afterwards while we were packing up and chatting I realized that everyone was thrilled to be there and playing. It seemed like a stark contrast to what I usually see in MMO forums and chat. So far the only downside to being part of an active group is that it has finally pulled me into using Facebook regularly. I’ve had an account for years but used it very little, like nearly never. August is now half gone, and while I’ve had a few days that were tough for me to get something written overall I’ve been totally happy with my writing. I have seen posts from some people that aren’t joining the event or have already dropped out. It’s understandable. I’ve certainly considered it myself a few times, especially when I sit down and think I’ve got nothing to say. But for me, that’s really the point of this. I start writing and after getting a few hundred words of drivel out of the way, something usually comes out that I didn’t realize that I’d been thinking about. I find that experience pretty cool. So if you’re participating and worried you run out of steam now that we’re halfway through, I think you should look at it as a good thing. It’s a chance to see what happens when you sit down and just start typing. Even if you don’t actually post it. I think I’m nearly recovered from GenCon last weekend. Today’s the first day that I didn’t end up taking an hour nap after the kids went to bed before waking up in a panic realizing I hadn’t done my blog entry yet. 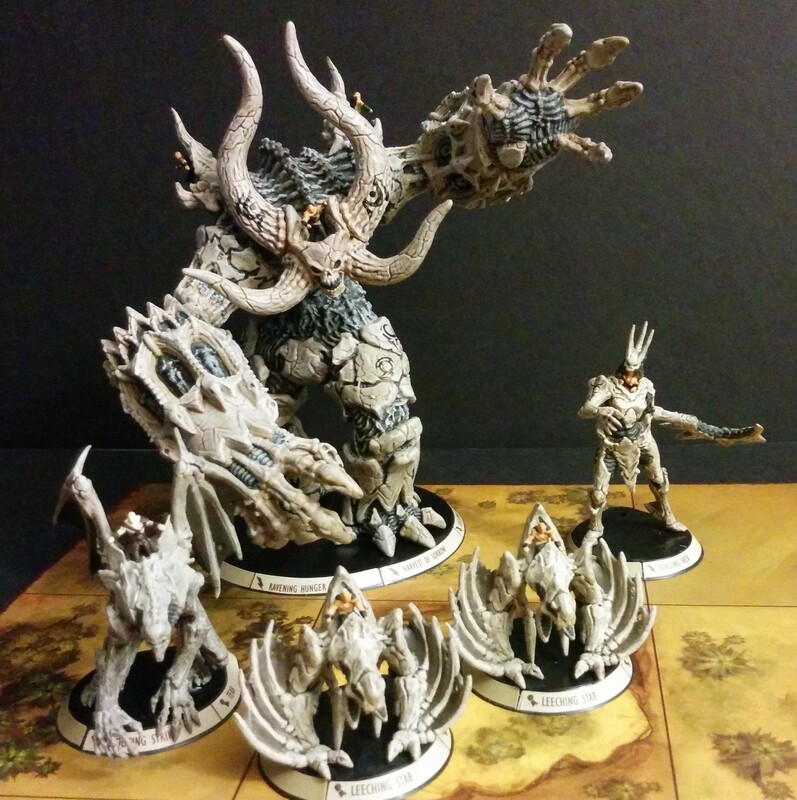 Anyway, I thought I’d continue with the GenCon theme a little longer, and write about what happens when I get an app version of a boardgame that I love. In some cases like Star Realms and Summoner Wars, I barely or never play the board game version. I don’t think these games make good examples though, since they offer online play and are two player games, giving me many more opportunities to play the app than the board/card game. Not really a fair comparison. 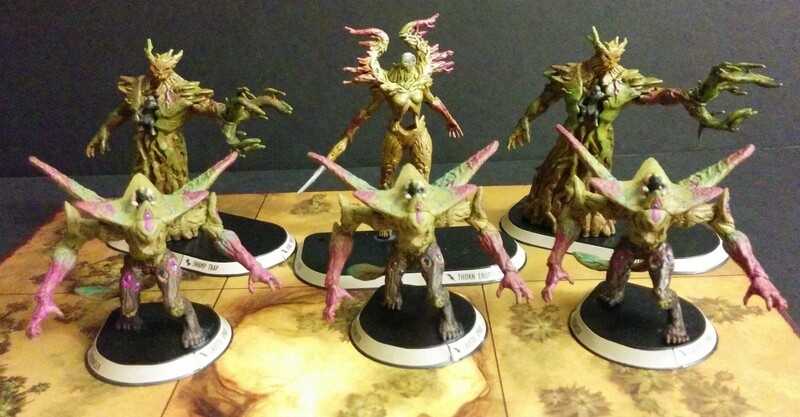 Sentinels of the Multiverse is a better test case. The card game has a lot more content available for it than the app, yet I haven’t gotten my cards out once since Handelabra released Sentinels of the Multiverse: The Video Game. The convenience of having a device handle all of the housekeeping is just too nice to pass up, not to mention being able to play it in situations where I don’t have the table space for the card game. Base on my GenCon demo expierience, I think the upcoming multiplayer will have me playing the app even more than the card game. 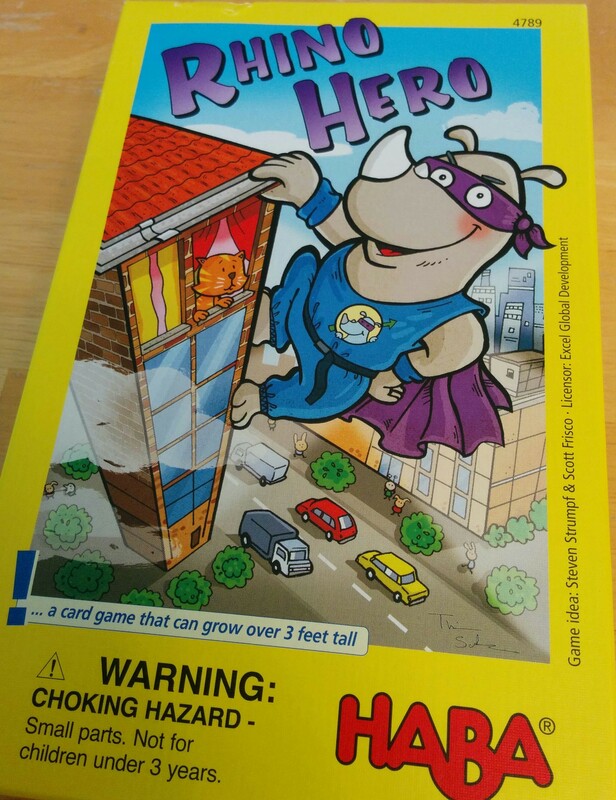 I don’t see myself giving up boardgames ever, but I wonder what it would take to get me to prefer an original game over a well-done app conversion. Maybe miniatures? 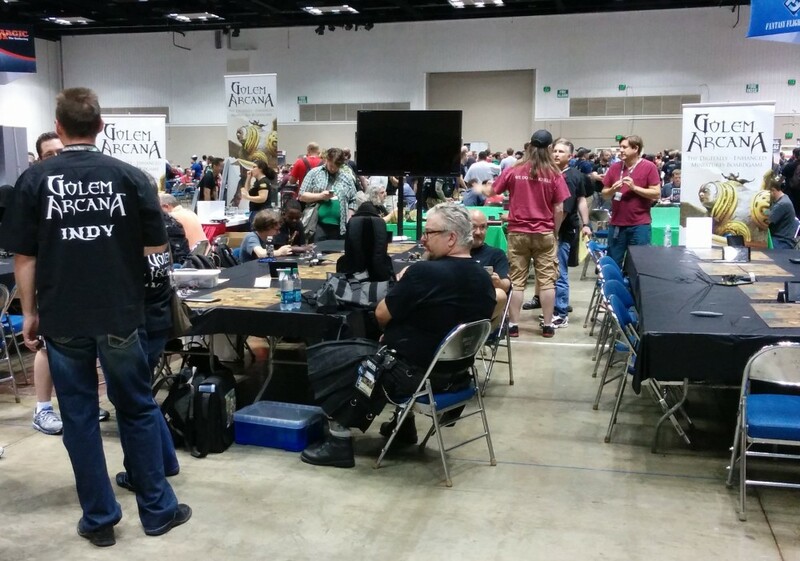 Any bets on how many more blog entries I can wring out of GenCon for Blaugust? Don’t forget to go check out the Blaugust Initiate Page. Category: Rambles | Comments Off on Bits or cardboard? 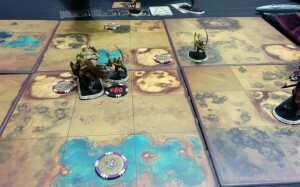 GenCon kicked off on Thursday morning and I started off the convention in the giant Will Call line. It stretched across the length of the convention center and looked pretty daunting, but I had been through the same thing the year before and found that the line moved pretty quickly. I ended up getting through and picking up my event tickets in about fifteen minutes. I passed even that short of a time pretty quickly by talking to the people in front of and behind me in line. That isn’t the kind of thing I normally do, but it’s part of the magic of GenCon for me. It’s four days surrounded by thousands of people who are at least as weird as I am. It’s a very liberating experience. 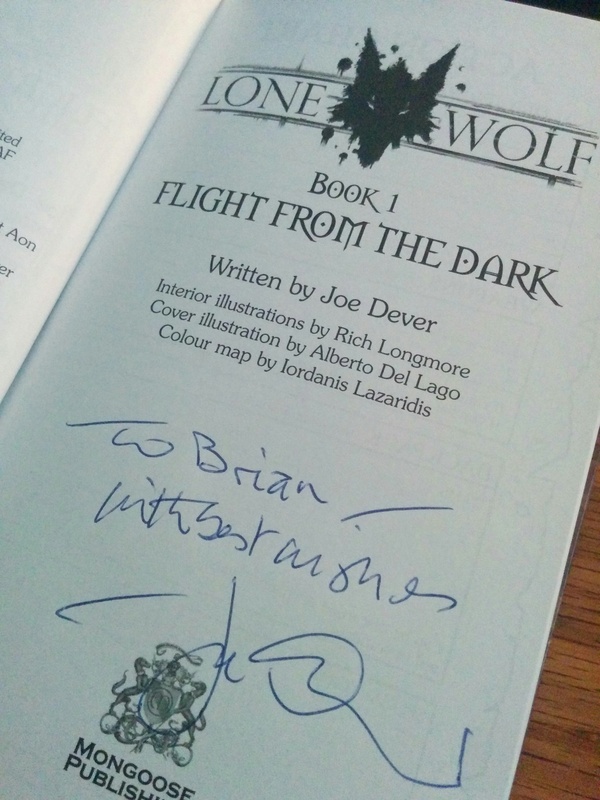 The high point of the first day for me and possible the whole convention was getting to meet Joe Dever and getting my copy of Lone Wolf #1 signed. He was super friendly and very generous with his time. 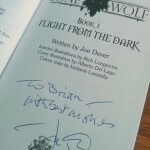 The Lone Wolf gamebooks were a big part of my childhood, second only to Tolkien’s Hobbit and Lord of the Rings, and it was a complete thrill to get to meet Mr. Dever and tell him that. I was giddy the rest of the day and thinking about it still makes me grin. Most of the rest of the day I spent in Hall F which is where Harebrained Scheme’s Golem Arcana play area was. I had signed up for the Midwest Tournament and a large number of the other people in it were from my playgroup here in Indy (note the bowling shirts), so there were plenty of other games to watch when I wasn’t playing myself. I had a bye for the first round as a result of League Play earlier in the year, and I managed to narrowly win my Round Two game. Unfortunately I lost my Round Three game so I didn’t play in the semi-finals on Friday, but it was a super close game. By the way, I say “super close” not cause I’m trying to mitigate losing. I really enjoyed that game. Both myself and my opponent played extremely well, and the game literally game down to dice rolls on the last two rounds. Had I’d rolled a hit, or had my opponent rolls a miss on the following turn, the outcome would’ve reversed. I totally prefer games like that over just steamrolling someone. Although winning is always nice. I capped off the day by meeting up with my friend Todd (Wininoid) and playing games in the convention center until they shut the lights off in the play hall at midnight. We had to pack up by cell phone flashlight. I’d gotten up at 7 am Thursday and didn’t get home and get to bed until 2:30 am. I was pretty amped up from the day even though I was exhausted, so it took me an hour to wind down enough to sleep. One last thing! It’s not too late to join in, unless you’re reading this after August 31st. Visit the Blaugust Initiate Page to see how. I like to avoid frustration in my gaming hobby. Fighting games especially are something I avoid now, as once upon a time I broke a couch kicking it after a bout against the CPU opponent. The surest way for me to end up putting down a game and never coming back is to suddenly ramp up the difficulty level without warning or preparation. Having said all that, I’ve been spending the last few nights attempting to win the third quest in the Lord of the Rings card game, Escape from Dol Guldur. I’m at about eight attempts now with zero successes, which is well past when I would have give up on a computer game and moved on. Board and card games like this are more like puzzles than tests of reflexes, which apparently causes me less frustration. I’m planning to keep at it until I win. Last night was supposed to be the initial session of Adventure Co. 2.0, but Scopique had a water heater emergency and had to cancel. Totally understandable, and I hope he gets it fixed quickly and cheaply, but I’m a homeowner myself and those two things rarely go together. Even without our Dungeon Master, the rest of us (Adventure Co veteran Tipa from West Karana and new comers GrilledCheese28, Oakstout, and Girl Grey) hung out for about half an hour and talked over what kinds of characters we were thinking of playing as well as played around with the tools in Roll20.net. My initial impulse to play another Wizard changed a bit after reading through the Player’s Handbook (PHB), and I’m now thinking of going with a Druid. I’m not totally committed to it yet but I also like the idea of playing a Forest Gnome. I expect to change my mind a few more times before next Thursday. The 5th edition rules remind me quite a bit of 3.5 and earlier, but there’s also some Fate influence in the rules (or similar narrative driven system). There’s a chapter on personality and backgrounds which helps fill in character details beyond the normal height, weight, and alignment. You now decide on an Ideal that drives your character, a Bond that ties your character to a person or place or event, and a Flaw to make you character interesting. They’ve also added the mechanic of Inspiration, which is given out by the DM as a reward for playing into your character’s personality traits and can be used to gain advantage on rolls. It’s not quite the same but it immediately made me think of Aspects, Compels, and Fate Points. Reading up on 5th edition and getting on Roll20 last night with the group had me excited to work towards running a Fate Core game. At least once I get my Adventure Co character figured out and we’re a few sessions in. 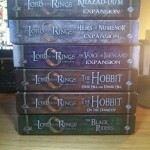 Among the many board games in my backlog, The Lord of the Rings: The Card Game, has been on there the longest. I actually bought it a few years ago before I really got back into board games because I saw it on the shelf of my Friendly Local Game Shop while browsing Warhammer 40K minis (which I like to look at but never buy) and role-playing game books and saw that it was designed for 1-2 players. So now years later, I’ve attempted to get started with the game a few times, but the game is very difficult and I’ve found that I’m pretty awful at constructing decks. So in March I started reading through and playing decks based on Beorn’s Path. The Hall of Beorn is one of a half dozen blogs dedicated to the game and Beorn’s Path is a nice series of articles that introduces players to building decks that can be used to complete the quests in the base game as well as the first six adventure packs, The Shadows of Mirkwood Cycle. Like most things I ended up distracted and didn’t pick the series up with Part 5 until this evening when I finally managed to beat the second quest in the base game, Journey Along the Anduin, on my third try. I’m not ready to review the game yet. I haven’t played it nearly enough and I’m still at the novice stages of being able to build decks and learning all of the available cards even out of the relatively small core set. My initial impressions though are that the game is very tough and unforgiving. Luck feels like a big factor to me, but I have the feeling from what I’ve read that feeling is more because of my beginner skill level and because of the game itself. 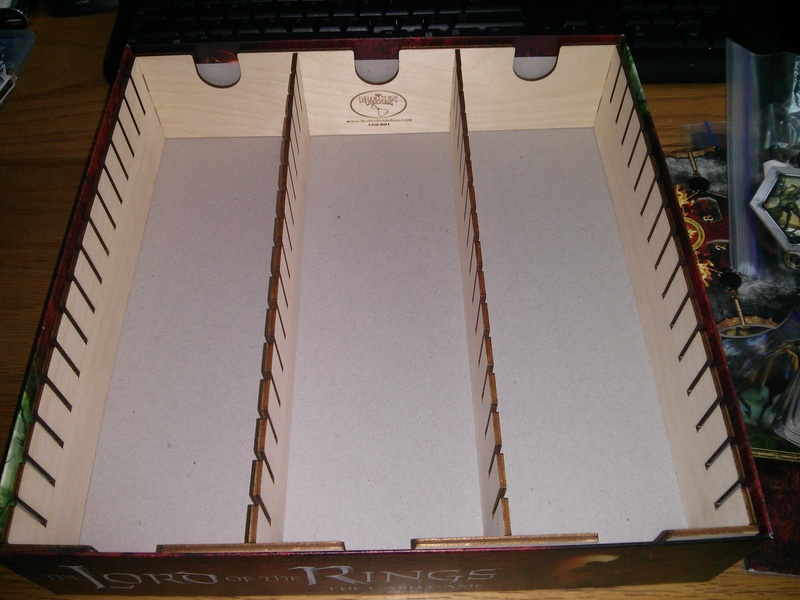 A big challenge involved with board games is organization and storage. Imagine for a moment that your Steam games library required physical space. After buying a game or ten during one of Valve’s insane sales, and hopefully playing the- sorry I can’t even finish typing that without laughing, you then had to figure out where to store it. 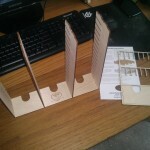 Now add the additional challenge of organizing the pieces of the game inside the box. 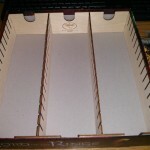 While some board games come with good inserts, most do not. Pathfinder Adventure Card Game and Marvel Legendary are two pretty good inserts, but after three expansions the Marvel Legendary one will literally not fit one more card. 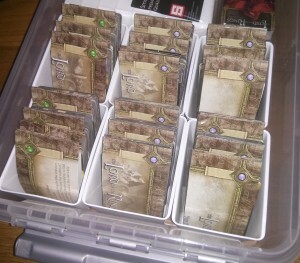 The Lord of the Rings Living Card Game from Fantasy Flight just came with a basic cardboard insert, nothing fancy but nothing worse than what an average game comes with. 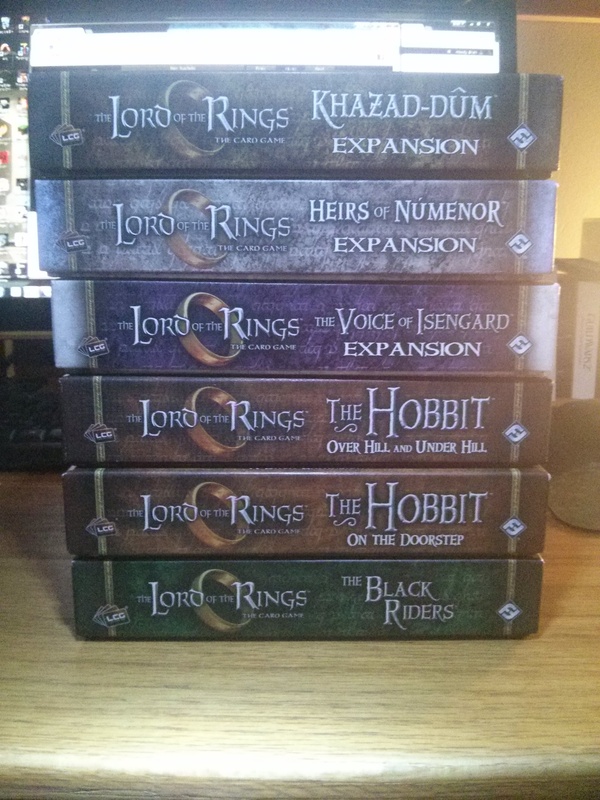 Unfortunately there was no thought given by FF for expansions and LotR the LCG has had a lot of expansions. 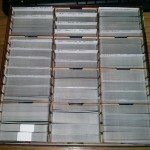 The original core game started with 226 cards. Add to that 3 Deluxe Expansions, 3 Saga Expansions, 3 full Adventure Pack Cycles, and half of a fourth and the current card count is now 2,290 card. Once the current Cycle finishes and the next announced Deluxe and Saga Expansions come out the card count will be 3,026. 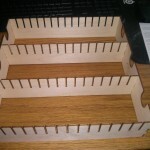 Initially for storage I tried a plastic organizer, but I wasn’t happy with the results. There was a lot of wasted space in the box and the cards were loose enough that I worried about them getting bowed (something that’s been and issue with my Pathfinder insert). 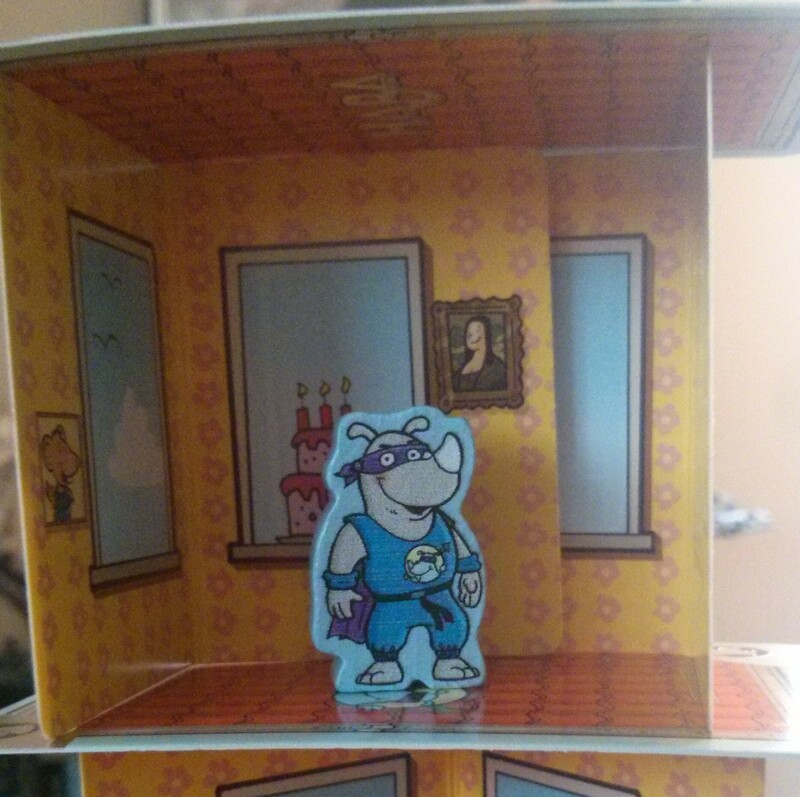 Plus I didn’t like losing the art for the original box. 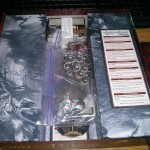 Months later, I ran across mention of a company that does custom inserts for games called The Broken Token. 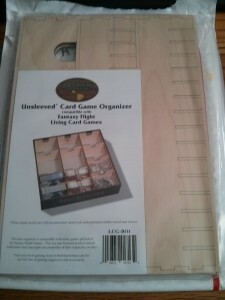 Their kits are laser cut from thin wooden sheets and they have a nice once that works with any of FF’s card games either sleeved or unsleeved. 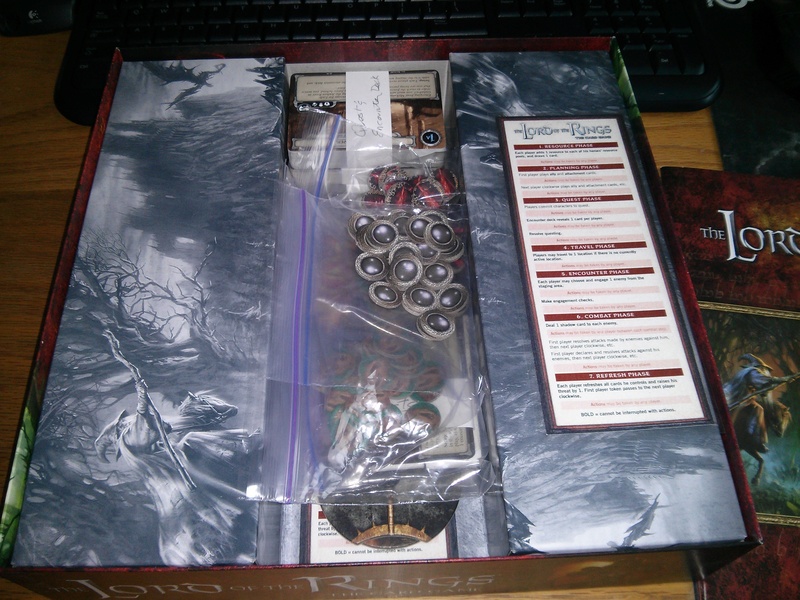 It would allow me to reuse my LotR LCG box and was only $19, so it was well worth a try. I got the organizer today in a flat envelope. 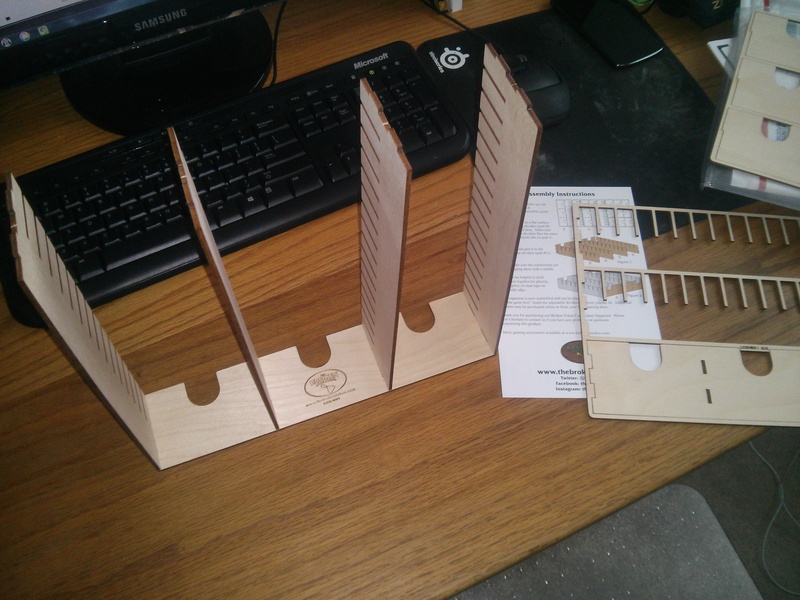 The kit contained some directions and four sheets of wood. Assembly only took me about 15 minutes and no tools. From looking at the instructions that can vary a little bit since sometimes the pieces need to be trimmed slightly, but I had no issues with mine. 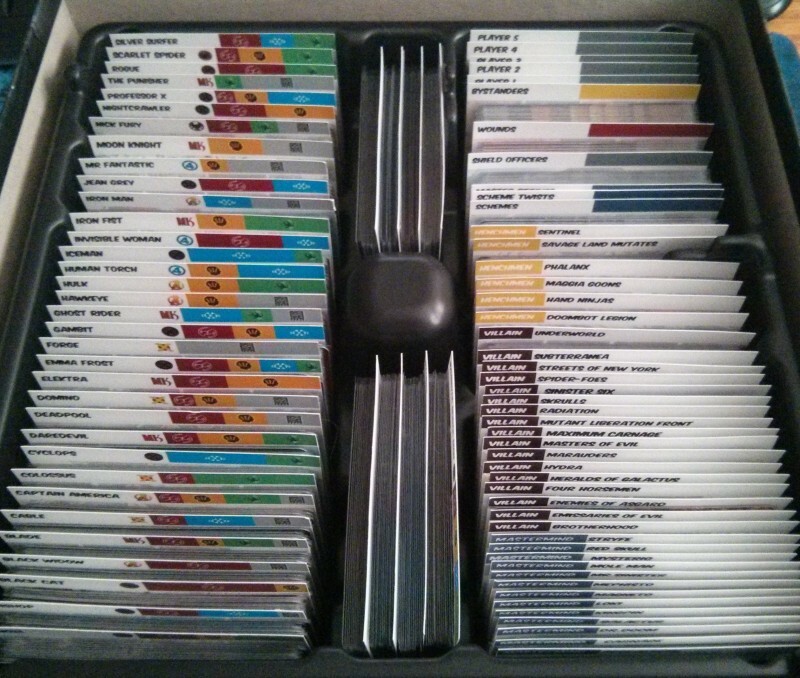 It actually took me longer to get all of the cards organized and into the box than it did to put the kit together. 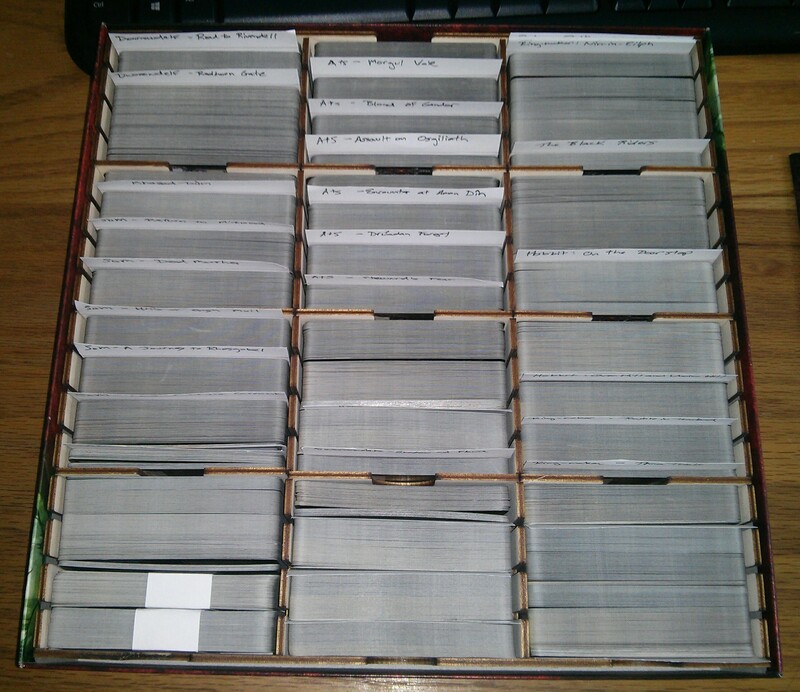 The insert allowed me to take the original box and a stack of Expansions, plus the plastic case of Adventure Packs above and condense it all into the original box. While I’m super happy with how easy it was to put together and how well it’s organized my game, I’m also about out of room in the original box. 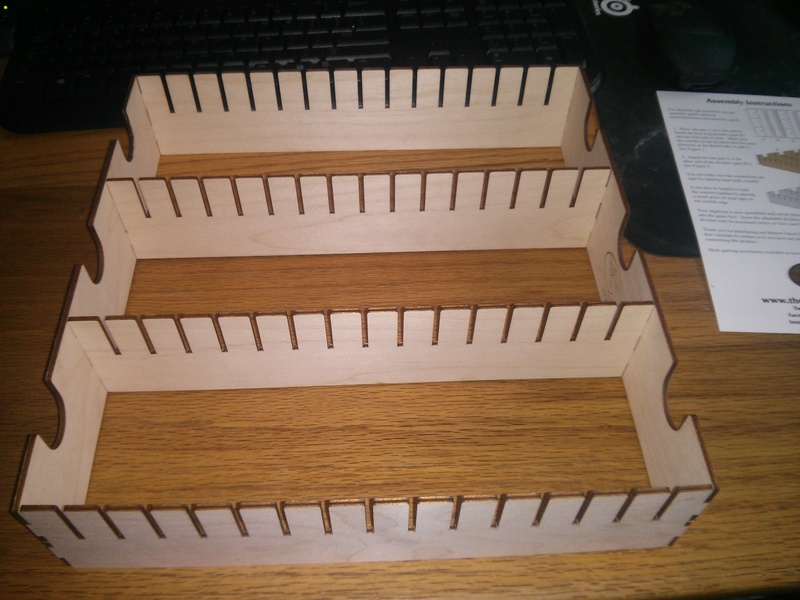 Plus I don’t have room in it now for the threat counters and tokens necessary to play the game. So when the remaining three Adventure Packs and two Expansions come out, I’m definitely not squeezing them in. One option would be to get a binder with card pages in it like a Pokemon or baseball card collector uses. 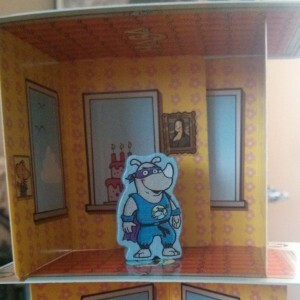 Another option is a larger box and organizer. That one is quite a bit more expensive but looks very nice. It may be odd, but I think organizing board games is an interesting aspect of the hobby. There’s a lot of room for creative solutions either with third-party products like Broken Token’s or DIY crafts like foam core inserts.